Today brings back memories of childhood. As a kid I remember being at school and having to make sure to wear green on March 17th. If you didn’t wear anything green then you could be pinched. Back then it seemed like a fun little thing but I never understood the meaning /where it came from. It turns out that this tradition dates back a long time but is strictly American folklore. People would wear green on St. Patrick’s day to prevent being pinched by a leprechaun. Interesting… So today if I wear green then I become invisible to fairy creatures?! It’s funny how these things come about and keep going through the years. 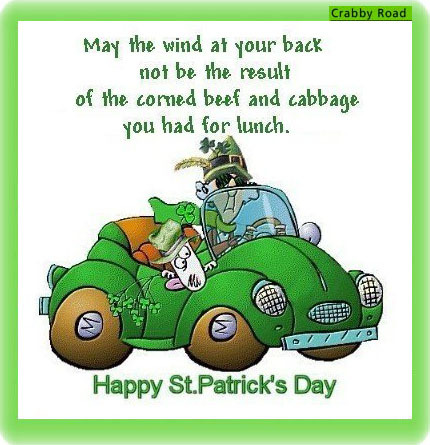 Today I’ll wear a color that I hardly wear and don’t really like wearing… I’ll also eat some unique food and drink some beer and pretend I’m Irish for the day. All joking aside, today is just a day to have fun, joke around and celebrate! Maybe if we drink enough green beer we’ll see a leprechaun… among other things.